Georgia day trips can make your visit to this beautiful state memorable and exciting. Whether you want history, some fun with the kids, or just to get back to nature, you can find what you are looking for in Georgia. The Georgia Aquarium. Eight million gallons of fresh and salt water and more aquatic life than any other aquarium makes this signature Atlanta attraction the largest aquarium in the world. Zoo Atlanta. Zoo Atlanta is one of the oldest zoos in the United States, having been in continuous operation since 1889. Just minutes from downtown Atlanta and Turner Field, Zoo Atlanta is located in beautiful, historic Grant Park. The Fernbank Museum and Science Center. The world's largest dinosaurs dominate the atrium while exhibits on Georgia's natural history, cultural history, wildlife, special exhibits like "Snakes Alive!" and "Chocolate" and the ever popular IMAX theater make this intimate little museum a very special place to visit. The Cyclorama and Civil War History Museum. See history come alive through sights and sounds as you step back in time to 1864. 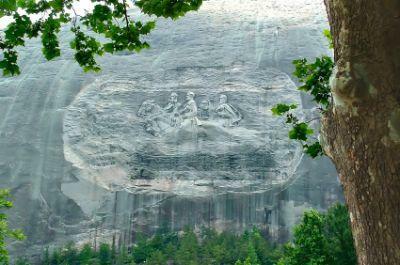 You will see the world's largest painting, "The Battle of Atlanta" as well as the Civil War locomotive, "TEXAS". The New World of Coca-Cola. The newly opened museum has something in it for everyone including the famous Coke Polar Bear, a great 4-D theater, over seventy product samples for tasting, the world's largest collection of Coke memorabilia, a full-functioning bottling line producing commemorative 8-ounce bottles of Coke and a pop culture gallery with the works of Andy Warhol and Steve Penley. The Face of the Mountain. The world's largest rock sports the world's largest bas-relief sculpture depicting Confederate president Jefferson Davis, and generals Robert E. Lee and Stonewall Jackson galloping on horseback throughout eternity. The Antebellum Plantation. Take a self-guided tour of this 19-building plantation with buildings that range from the eighteenth to the nineteenth century. The Skylift Cable Car. Your ride to the top of the mountain will give you amazing views of Atlanta and the Appalachian Mountains. Ride the Ducks Adventure. A forty-minute tour of the area that takes you from land to water in a real World War II Duck. The Scarlett O'Hara. Ride an authentic paddle-wheel riverboat on Stone Mountain Lake. Dug Gap Battle Park. There were battles here during the 1864 Atlanta Campaign. Pickett's Mill State Historic Site. A battle that General Sherman lost on his way to Atlanta. Kennesaw National Battlefield Park. The Battle of Kennesaw Mountain led to the capture of Atlanta. More information may be found on Georgia's rich Civil War history by clicking here. Think of Georgia you think of dense green forest, the Civil War and places like Atlanta, but did you know that Georgia's coastal wilderness is a place of pristine beauty with its white sand beaches, tidal marshes and coastal forests. What better way to see it than by kayak? Little Tybee Island. This chain of small barrier islands is a graphic example of dune formation and maritime forest evolution with a progression of palm, juniper, bay, pine and live oak trees. The islands are home to area wildlife such as dolphin, raccoon, gray fox, mink, feral pig, deer and alligator. Wassaw Island. A national wildlife refuge, the island is open to the public only during daylight hours. The island features a mature maritime forest, miles of deserted beach and the famous Bone Yard, a grove of now dead oaks that was taken by the sea. Still standing, the trees are exposed to the roots at low tide. Ebenezer Creek. An enchanting trip into the fantastic: A seven mile trip on a slow blackwater river that runs through a primordial-looking cypress forest where Spanish moss hangs and the sounds of wild things are all around you. Skidway Narrows. Are you looking for great summertime osprey viewing? This is the best area for that around. You will also find large hammocks and the remains of a Civil War gun embankment. More information may be found on Georgia's Barrier Island Getaways by clicking here. There is so much to do in Georgia, from the coast to the forests to the big city, that you could spend years and not exhaust it all. If you have never considered Georgia, take another look, you may be surprised.